There are 4 total books that Lee has written while incarcerated in Texas, with the first one being a 3 part series entitled, “The Wurst Little Courthouse in Texas.” None have been published to date. These sets of novels were hand written while in Comal County Jail for his first arrest (of 7.5 ounces of “marijuana” otherwise known as cannabis sativa) and the 10 month stay that resulted in a plea bargain for 10 months time served for the possession of cannabis, and 2 years State Penitentiary for a failure to appear in court on said charge. The initial arrest happened at 8:30am on 8/8/2008 on River Road coming from Canyon Lake, towards New Braunfels. Unknown to Mr. West he did have a “glass container on the river citation” from 2006 that did not get properly taken care of, and that led to a warrant. At the time of the stop in August of 2008, Mr. West did have a warrant for a $65.00 littering citation which was considered a “failure to appear” as well. The routine traffic stop led to an arrest of Gregory Lee West for failure to appear in court for a glass container of the river ticket. During the search of the vehicle, called an inventory search for towing property, a sheriffs officer found a bag of cannabis under a pocket copy of the United States Constitution. The Constitution was not listed in the vehicles inventory, yet the few children’s books were. 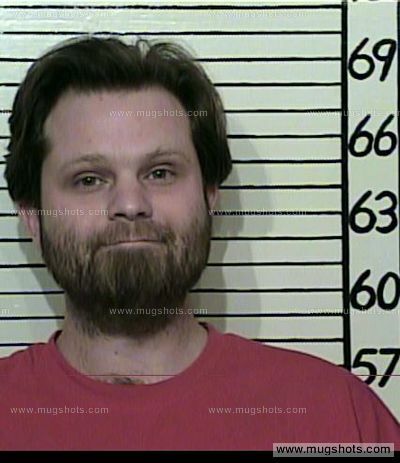 Lee West was in jail for the first time for a felony drug possession charge, and was told that he qualified for the “Drug Court” that was offered by the Justice of the Peace upon arraignment. He spent 8 days in jail trying to raise bond money. Comal County only allows certain Bond Companies to hold a bond for the county arrests, and most required a home owner to sign. From August to November 1, 2008 Mr. West called into the New Braunfels Bail Bond company every Tuesday morning to check in as was required for bond. There was a court hearing on the last Thursday of October 2008, but New Braunfels Bail Bonds did not notify their client of a court date. It was at this court date that the county decided to call Mr. West’s name and he was not present, thus issuing a bench warrant for his arrest, and forfeiting his previous bond, which took his family a 8 days to raise in the first place (Original bond of 15,000). Mr. West was in communication with the bond company during the next four months, and their only legal advice was to hire an attorney and turn himself in. There was no resources in which to hire an attorney. During the time that Mr. West had been arrested and posted bond, the West family was left homeless and without any way to support their two children. Mr. West made a horrible mistake to moving to another corrupt county in East Texas to be closer to people who claimed to be his family. The West’s found a home to reside in Jacksonville, Texas and his wife took a job at a local cantina to make ends meet. Lee had never been able to afford proper medical care since his leaving the Army, and had not been able to do manual labor for about a year prior to this period due to severe pain in his neck and right shoulder radiating down his back. He was quickly learning web development and coding so that he could possibly earn an income for his family when this traffic stop turned into a life changing arrest. On a Saturday night at around 10:30pm Mr. West was pulled over for speeding in Cherokee County Texas. February 18th, 2009 was the last day of freedom or having a family for Lee, as he would spend the next 352 days in a concrete and steel cage called the “Justice System” in one of three jurisdictions, and the next 9 years fighting to restore his family from what the state sought to tear apart. It was while in Cherokee County Jail the Mr. West met an infamous evangelical man named Robert Fox, who headed a local “church” called the House of Israel. It was at church for inmates where Lee asked Mr. Fox about his charges, and the response he received was the description of how the S.W.A.T. team from Jacksonville Police Department raided Fox’s church directly across the street from the Fire Department. Mr. Fox recommended that Mr. West spend as much time in the law library as possible and ask for “due process service proof” for the notification of the court date that was missed in Comal County in October of 2008. Information greatly appreciated by a first time inmate. Little did Mr. West know that the recommendation for finding said information would make Mr. West an enemy of the state. The second Monday in March, Mr. West was transferred to Comal County, Texas for two felony counts, one possession of marihuana and one failure to appear on that charge. The district attorney for Comal county, Sammy McCrarry, is known for public corruption and detaining Mexican Nationals in his jail for funds, without properly notifying D.P.S. or I.C.E. of their arrests. Some of the inmates were in state custody for over 365 days without going to court. The county jail staff work with the District Attorney to find defendants guilty of charges while in custody and do NOT provide private facilities for attorney client meetings. All conferences are held on a recorded video phone network and shared with the District Attorney’s office. Mr. West shared a court appointed attorney with one of the Mexican Nationals while in Comal County custody. 80% of the court appointed attorneys were from San Antonio’s Bexar County for district court felonies. Since the majority of the cases from any district court are usually a plea bargained conviction, it is a “wait it out in jail” scenario for 90% of those faced with felonies. Johnny Frausto was one of the many attorneys who was on state bar probation or some form of court sanctions for past actions. Frausto was complaining of cancer illnesses, in 2009, when speaking to Mr. West’s former wife who was helping her husband communicate from jail to this ghost of an attorney. John Charles “Johnny” Frausto passed away whilst Mr. West was in custody on August 19, 2013 from cancer. There was no notice given to his clients in jail. This was the last straw for Mr. West’s faith in any attorney, and required the State to uphold his right for self representation. In October of 2009, after 287 days in Comal County Jail, Mr. West was brought to court, without any legal documents, as they were confiscated by jail staff upon leaving his dorm, and while waiting alone in a holding cell. Once before State Judge Robinson, Mr. West again plead NOT GUILTY and requested a jury trial. The judge recommended speaking with the D.A. one on one first. In the private, unconstitutional, meeting where Mr. West told Sammy McRarry that he had lost everything he had, including his new family, that he has simply been asking for a jury trial to show his medical necessity and declare his First Amendment Right to possess a plant that God put on this earth. It was then that Mr. McRarry informed Lee that it would be another year in jail before he was able to be heard on that matter, and asked Mr. West if he had another year to wait to be heard. McRarry then noted he needed to talk to the judge about what he could offer. Mr. West instructed the D.A. to offer “time served” on the possession of marihana and drop it to misdemeanor, and drop the failure to appear charge since Mr. West had evidence back at the jail (that was taken before court) that he had made calls to the bond company and needed to show the jury that information. Lee West’s first mistake was taking the first offer that was presented on paper. Had Lee waited a few more days, he would have qualified for a bond reduction, however, when one represents them selves in court, they are required to know the rules and procedures of said courts to a certain extent. Not knowing that the several Writs for Speedy Trial would have been held up, and the delays for the state seen as just that, delays, Mr. West would have likely won a jury trial in his defense based on the contempt shown by the District Attorneys office in delaying the trial, and obstructing justice in allowing Mr. West proper access to the courts. Despite not know anything else better to do, Mr. West signed the two Felony charges in order to get home to his wife and kids. On October 26th, 2009; conviction papers were signed and filed with the state in the case of the State of Texas vs. Gregory Lee West. December 23rd, 2009 Mr. West caught chain to TDCJ and the intake Holiday unit, where he spent the holidays. January 22nd 2010 Mr. West left the Walls unit on parole until February 2011. Mrs. West was in Huntsville to pick up her husband on that cold January day. It was then that Lee learned what had been taking place in his home while he was gone all those days. Since that situation is still being described in the West divorce case in Cherokee County to date, the events will be left out of this description, except for logic. Mrs. West was doing her best to try and bring home her husband, and had never reported or claimed any problems with Mr. West. It was not until she admitted to cheating several times on Mr. West with several other men, did she have issues with Mr. West. And it was Mrs. West that called the parole officer in September of 2010 to notify parole that Mr. West was using cannabis to treat his chronic pain. On February 14th, 2011, while in TDCJ custody, Mr. West was issued divorce papers citing a protective order that was from Anderson County Texas. Texas law does not require any probable cause to file a family violence protective order against a party. Mrs. West was instructed to leave the county of the complaint and take it to a neighboring jurisdiction by the Jacksonville Crisis Center, “so that the vacation can not be worked due to a lack of jurisdiction” (laymen terms for they can issue a protective order in another county that can not be challenged by the defending party). The order had been issued on February 1st, 2011, and the court date for a hearing was the date of service. On February 20th, 2011 Mr. West left TCDJ having served his time on his charges and rode a bus from Henderson Texas to Jacksonville. There he found his meager possessions in a storage unit packed by his soon to be ex-wife, and the man who paid for it all, his mothers husband, with some advice, “leave town.” While visiting a friend in Jacksonville on the day of his release, Mr. West learned that his wife had moved in a drug dealer who was selling pills and cocaine from the West home on Bryan street. The West children would corroborate this story over the next 7 years, as well as positive drug screenings and recorded audio with the children’s confessions. None of the evidence to defend Mr. West from the false allegations of his adulterous former spouse would sway the court. The court had been bribed to find favor with the accuser so that any attempt for Mr. West to challenge the jurisdiction of the protective order, or show evidence of abuse against the West children would not be allowed into evidence. In April of 2013 Mr. West filed a formal grievance against the divorce court judge one Craig Fletcher for cussing at Mr. West in 2011 and not allowing evidence into court since then. When Fletcher learned of the grievance from Steven Raid Guy, (Mrs. West’s attorney and JPD and Cherokee Counties attorney of record) Fletcher held court and found Mr. West in contempt of court and sentenced him to 180 days in jail. On June 10th, 2013 Mr. West presented a check for the remaining $380 of child support monies that he owed, but the check was denied in court because it was not made out to Steven Raid Guy. The cost of the drug test that was positive by Richard Kincade cost Mr. West $375.00 and the drug test was the reason why Mr. West was not current on support. Steven Guy drafted a document that included $6,500.00 in attorneys fees added to the back child support amount and signed the document himself and filed it in the divorce case. Mr. West spent 177 days in 2013, placed in solitary confinement in Cherokee County Jail with NO order signed by a judge placing him there or charging him with any crime reported to DPS. 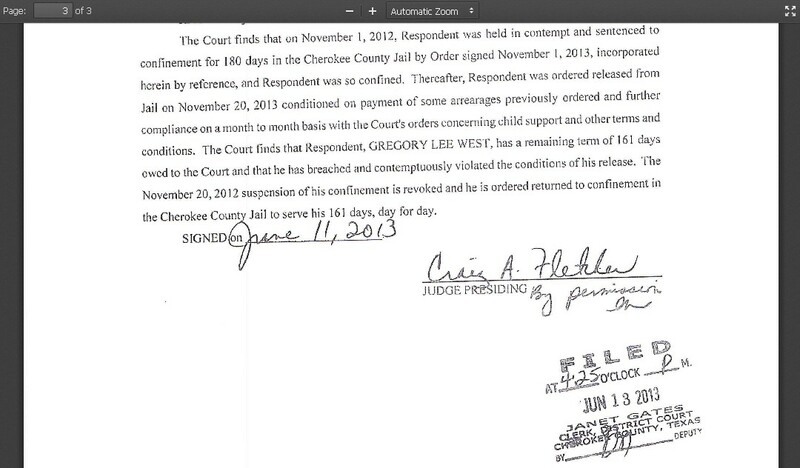 Mr. West filed several Writs of Habeas Corups (link to pdf) to which the Cherokee County District Clerk did not file until the Texas Supreme Court issued a response to the receipt of their copy. Mr. West mailed a copy of a Writ of Habeas to Janet Gates on July 6th, 2013 yet she waited past the mandatory 10 maximum file date until July 24th 2013 to actually time stamp the Writ. The higher courts remanded the case, and then eventually picked it back up citing Mr. West’s inability to provide court records that are not available, to someone in jail or out. What does any of that have to do with Twin Peaks on May 17th, 2015? Having been a victim of malicious prosecution, Mr. West noticed that the mass arrest of 192 individuals who met at a political meeting in the town in which Lee resided, was all to similar to the Robert Fox raid, and subsequent cover up. Lee was careful to inform the “responsible parties” involved in the Twin Peaks aftermath, of his prior history with corruption and the negative words that existed used by attorneys to defame Mr. West’s character. It was pointed out that all of the accusations that had been made against Lee West were never presented with facts or proof and written by an attorney for the state, or by the ex-wife herself, in order to keep custody of the West children. In June of 2015 several people were online on the All for 1 facebook page commenting on the tragedy, and Mr. West offered some of the families information on how to file grievances with the Texas Commission of Jail Standards for defendants who were not allowed medications in the Jack Harwell Detention Center. It was during this advice that Mr. West discovered some unsavory information that the jail was not owned by the county of McLennan, but rather an LLC that could not be sued for libel for their actions. Lee West was in Tyler Texas on May 17th, 2015 and just so happened to be having a last beer with some friends before a 30 day trip to the Del Mar Neurocenter for Magnetic Resonance Therapy for Post Traumatic Stress and Traumatic Brain Injuries. The bar happened to be owned by motorcycle enthusiasts who welcomed one of the clubs involved in the Twin Peaks tragedy and cell phones began to alert rapidly, and faces became pale with concern. The television was already on and the tragedy was unfolding before the nation as dictated by Main Stream Media. One man commented that it was not supposed to go that way at all, and he left on his bike. Mr. West did not pay that much attention to that comment until months later. During the after math of the Twin Peaks ambush, social networks buzzed with concern, conspiracy theories and out right lies concerning the events of that fateful day. 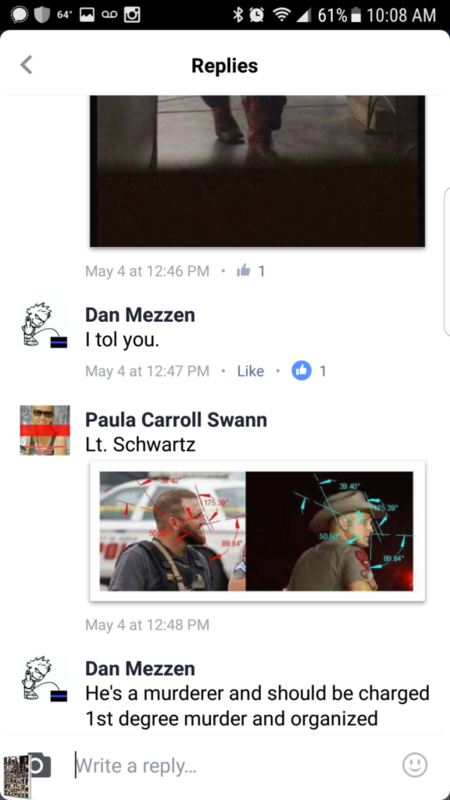 A facebook page was made by a fireman to add family members of the tragedy to, so that an alternative to All for 1 could be managed by non-biker members, who were trying to compile information on the event. The grouped titled American Bikers Community Rights or ABCR was formed and Mr. West requested membership. It was a matter of days before Mr. West was asked to help administrate the page along with the addition of members. In the early days of ABCR it was a predominately Yellow and Black page as the message of an ambush laid by Law Enforcement and the encroaching riders from the north was a common theme. After several months of online sluething and posting of information, Mr. West was asked to build a web page to archive the ABCR group to, in case facebook shut down the page. The information would still be available for the family members. Mr. West agreed and started a now defunct abcr.info web page. The information would include information found in the closed chat group thread where several of the victims of the tragedy would share accounts of the incident. That web site was attacked on October 23rd, 2016 with a D.o.S. and the page was lost to the public, after an article was published involving Steve Cook from the IOMGIA and Steve Woosnam for their participation in the training of Waco Police Department and the McLennan County Sheriffs office in April of 2015. Since authoring this information for the victims of the tragedy of Twin Peaks, Mr. West has received several false allegations from “bikers” who claimed that Lee had not been honest with those involved and cited information from court cases in other counties as proof of the allegations. One “journalist” who would later become a states witness for the prosecution had written several pages of “findings” that alluded to Mr. West’s former last name being different than it is now as proof that Mr. West was not who he claimed to be. Despite that same “journalist” using the last name of White, which was nothing more than the color of her husbands motorcycle. All of the allegations and false claims had already been revealed to those who were in the closed room, and private thread. When the information that a person reveals about themselves to remove doubt, is used to include doubt later, it is obvious of the intentions of the users of that information. An Undercover Department of Homeland Security agent posing as a protestor, who also dated a member of the defense team’s counsel welcomed any negative opinion about Mr. West, and had a direct hand in trying to levy misinformation against Mr. West to discredit his character, only after Mr. West would not conform to their narrative needed for court hearings. In April of 2016, Mr. West was arrested in McLennan County on a warrant on a Smith County charge of DWI. Mr. West had already served his time on this matter, yet the Smith County court would not allow the time served into evidence due to the Unconstitutional nature of the confinement without a signed order. During this incarceration Mr. West was removed as the administrator for ABCR and the false allegations against him were allowed to permeate the message from the group. The authoring of Texas: One Nation Under Arrest is in response to that groups efforts to misinform the masses.